Ecologists studied the animals living in and on the seafloor of the East Coast study area. It is important to know what species of animals and how many live in the region, as well as what habitat they like to live in, so that we can protect our amazing coastal sea life. This section provides a summary of the East Coast REC results for the ecological research. You can find out more about the scientific research techniques mentioned in the sections below by visiting the “How we study the seafloor” webpages. Read our Sustainability webpages to discover how these results will help protect the East Coast REC area. 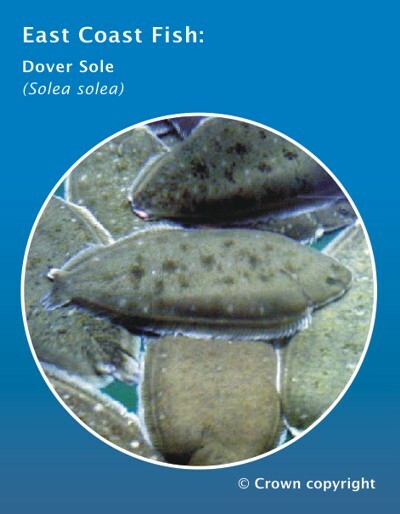 During the REC, ecologists discovered that there are many different animals living in the East Coast seafloor. Working from a boat, the ecologists used a Hamon Grab to collect 158 samples of infauna to study. 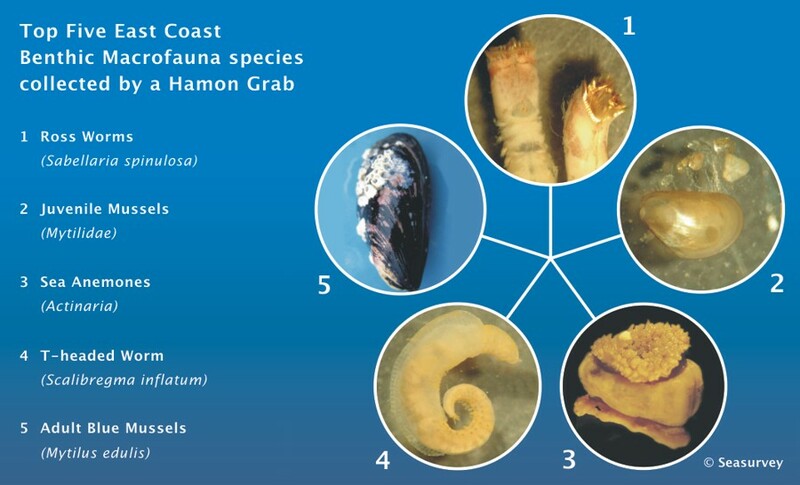 It is important to note that the Hamon Grab will also collect some epifauna, animals that live on the seafloor too, so often the results contain both epifauna and infauna species. In total, the ecologists discovered 391 different types of benthic macrofauna. The ecologists identified combinations or patterns of animals living together from the information they collected. They discovered 14 different groups that like to live in different environments. First, they recorded the infauna by animal types. The most common animal type in the East Coast was the Annelida, which is a term that describes most marine worms. Each animal type, known as phyla, is made up of lots of different species, for example, the Ross worm and the T-headed worm are both Annelida. The ecologists found that the diversity – the number of different species living in one place – was relatively low around the East Coast area. Most samples consisted of less than 17 different animals. Can you work out where the biodiversity is highest, from the map? Using trawling nets along the seafloor is another method for exploring marine life. Ecologists used this method when they studied the East Coast seafloor. 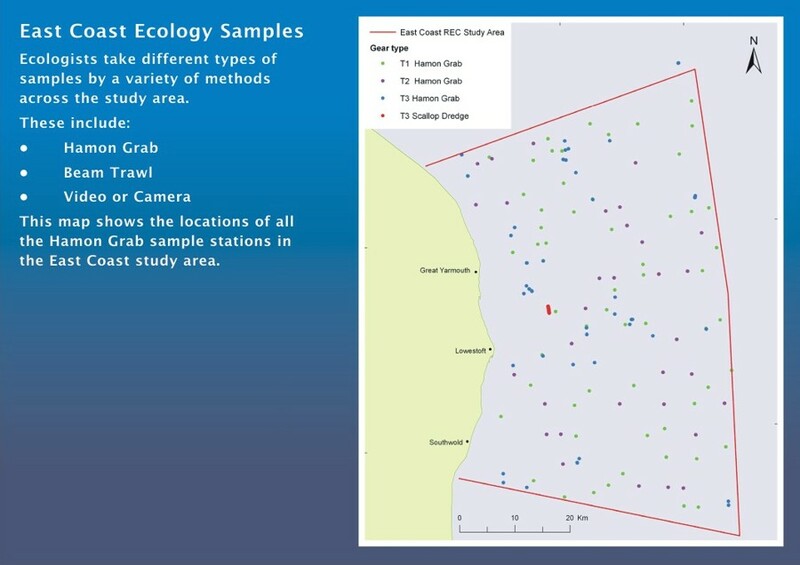 The beam trawl collected 127 samples of epifauna and demersal fish for the ecologists to study. 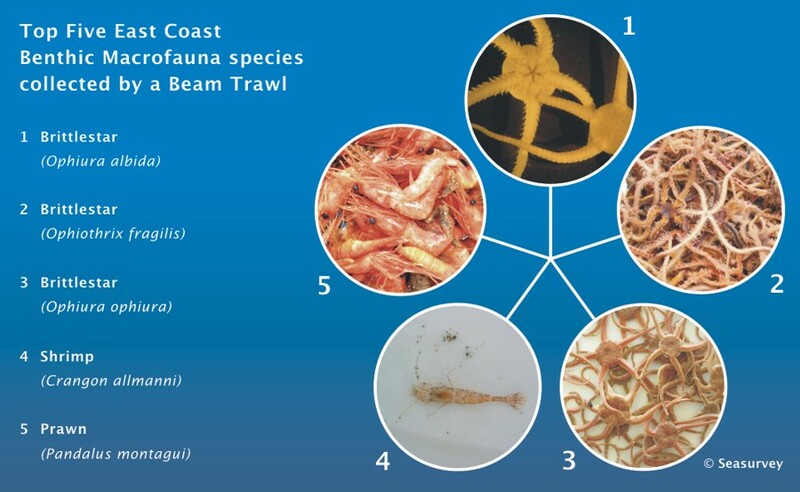 It is important to note that the Beam Trawl will also collect some infauna so often the results contain both epifauna and infauna species. 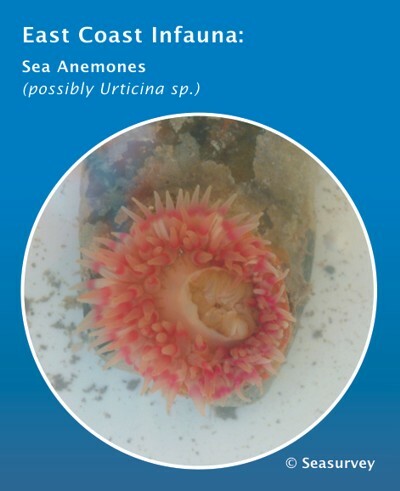 In total, the ecologists discovered 130 different types of benthic macrofauna. The most common animal type from the trawl samples was Echinodermata. 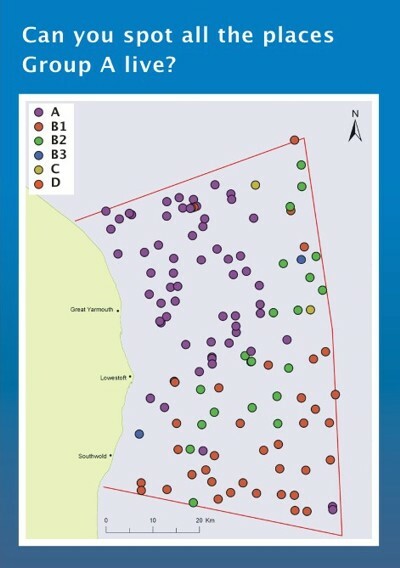 Ecologists discovered low numbers of sea animal in samples taken from the centre of the north half of the East Coast region, compared to the rest of the study area. This suggests that this area is not an ideal habitat for sea animals. 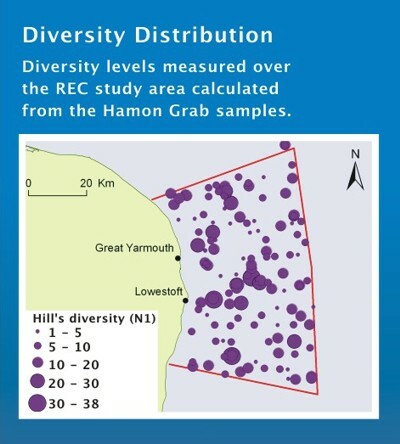 The hermit crab turned up the most in samples, collected in 123 out of a total of 127 trawls. Again, ecologists looked for different combinations of animals that live together out of the larger epifanua. 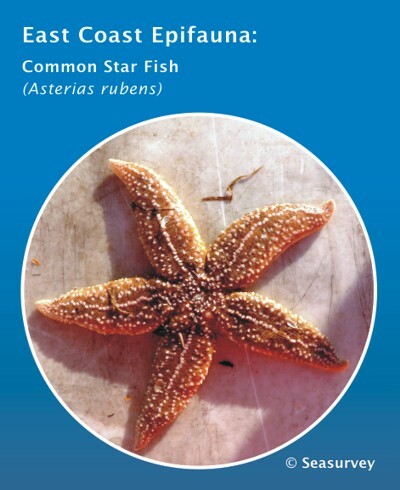 This time they found 13 groups, named A to M. For example, Group A includes brown shrimp, hermit crabs and the common starfish and is notable for not having any brittlestars, which are common elsewhere. This group did not have a single preferred habitat; they lived in a variety of habitat types. 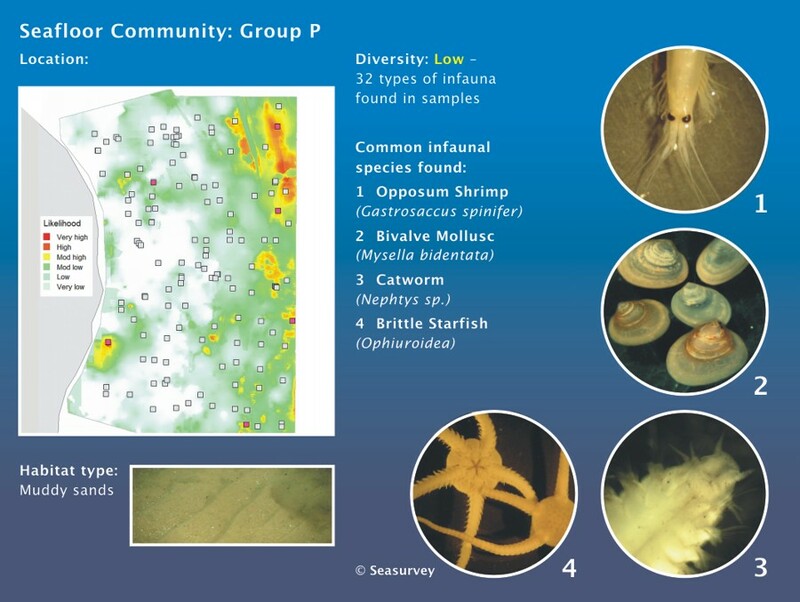 Understanding seafloor communities and their habitats is important to help us protect sea life in the East Coast area and all around the coasts of the United Kingdom. Ecologists give each seafloor community and its habitat a classification called a biotope, which provides a description of its key components.